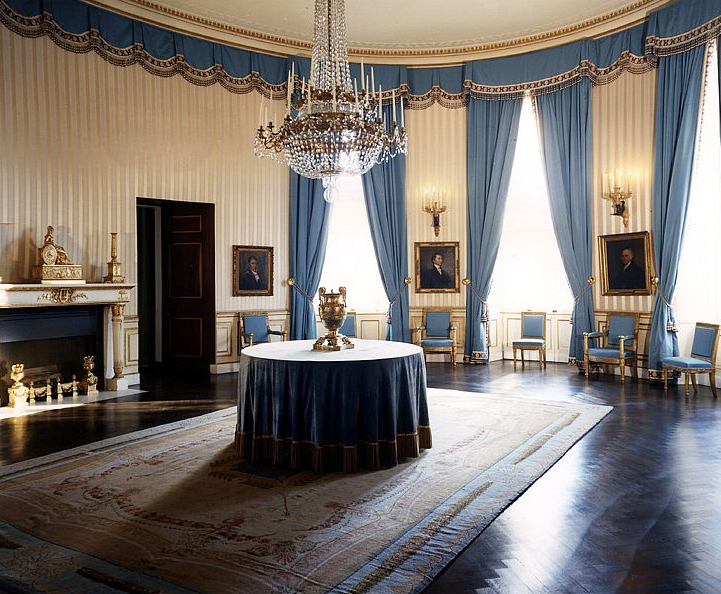 The Blue Room at the White House is another of the interiors brought to classic splendor at Jackie’s bidding. Several of our latest beauties will be debuting at What’s New What’s Next at the New York Design Center tomorrow, and we can’t wait to share them with you! I’m highlighting special designs that represent panache today. 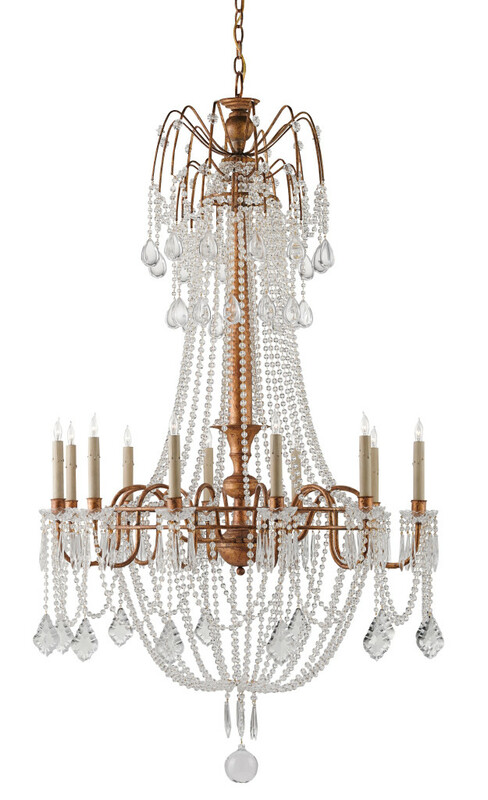 The Jolie chandelier in the Lillian August Collection is a wrought iron and crystal composition finished in a French gold leaf. During a sneak peek at the full spectrum of products at the Atlanta headquarters in early August, Cecil Adams was uncovering one gorgeous furnishing after another. It’s remarkable how historic design underpins all of the offerings—even the contemporary pieces have provenance in some form or fashion. What came to mind is the legacy of another pinnacle of classical design, our former First Lady Jacqueline Kennedy Onassis. 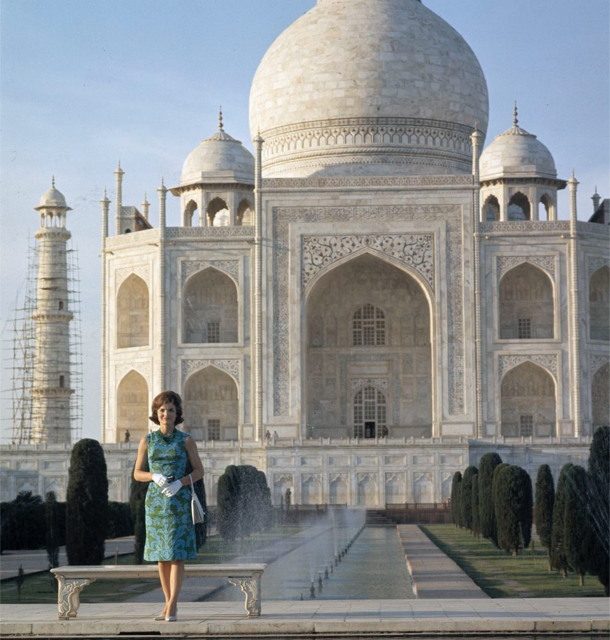 Jacqueline Kennedy photographed in front of the Taj Mahal. Photo courtesy the JFK Library. If you plumb the depths of Jackie O’s dedication to classicism, you will find an intelligence and a dedication to the history of design at its core. 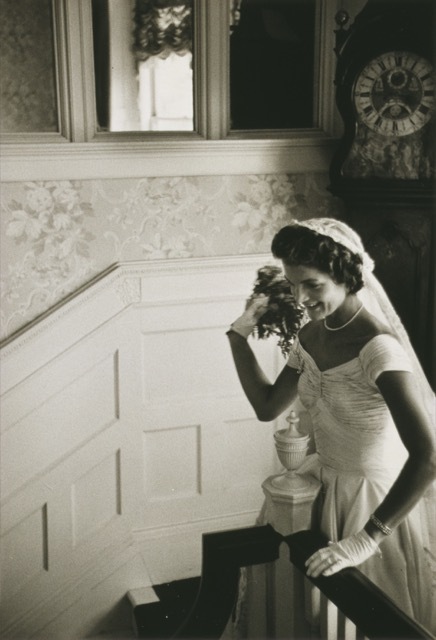 Jackie is ready to toss her bouquet at her wedding to John F. Kennedy; photograph by Toni Frissell courtesy of WikiMedia. It’s no secret that Jackie was a style-setter in the truest sense of the word but one of the things we love about her is the fact her choices were grounded in her knowledge of history and her worldliness—classic tastes honed by parents who understood the past had a great deal to teach her and her sister, who would become the prominent socialite Lee Radziwill. 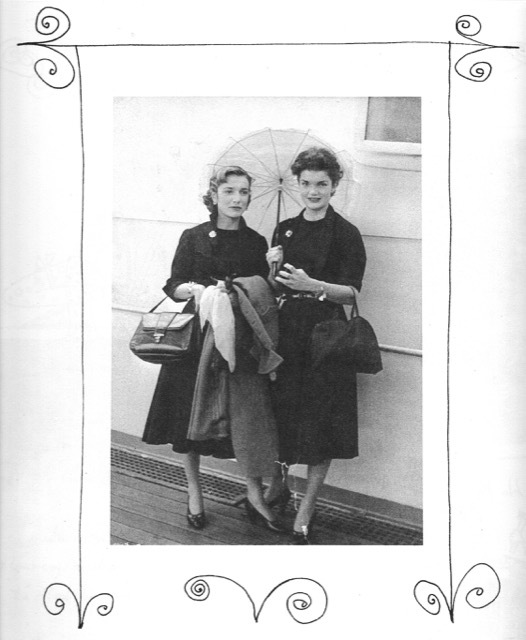 Delving into her legacy, you’ll come across a wonderful slim coffee table book the sisters had written after a three-month mini grand tour of Europe they took, which included stops in Spain, London, Paris, Venice, Rome and Florence. Lee was 18 at the time and Jackie was 22. 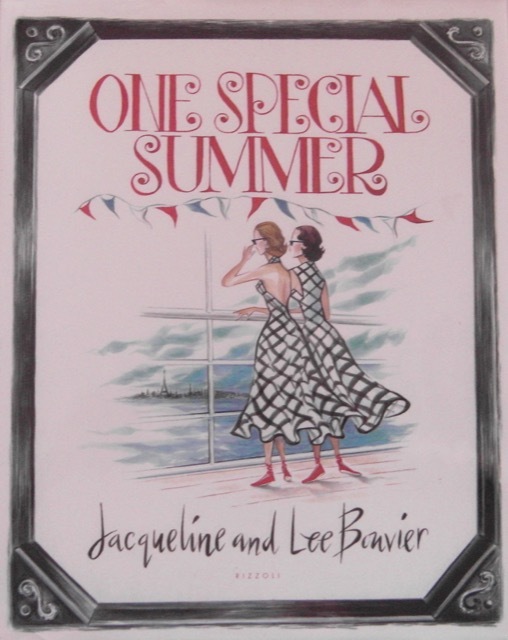 The cover of “One Special Summer,” penned by Jacqueline and Lee Bouvier to commemorate their three-month tour of Europe. They titled their cheeky illustrated journal One Special Summer and presented it to their parents as a thank you upon their return. Jackie rendered the delightful drawings, and wrote the poetry and a few of the descriptions of experiences. Lee penned the narratives about their capers as they traveled around the continent in a small car they bought in London solely for the trip. Rizzoli published the journal in 1974, and I highly recommend it if you’d like to experience the playful personalities of these charming young women, who would both go on to become influencers in so many ways. The above image of the two sisters was taken when they returned to America, the text below it—“It’s All Over Now”—dated September 15th, 1951. 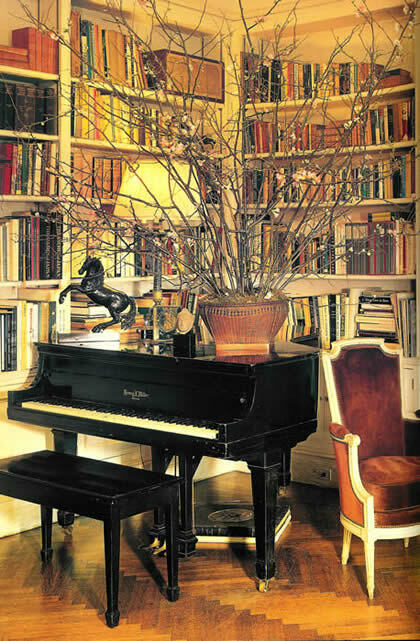 The dining and living room of Jackie’s Fifth Avenue apartment illustrates her love of books and her commitment to classicism. 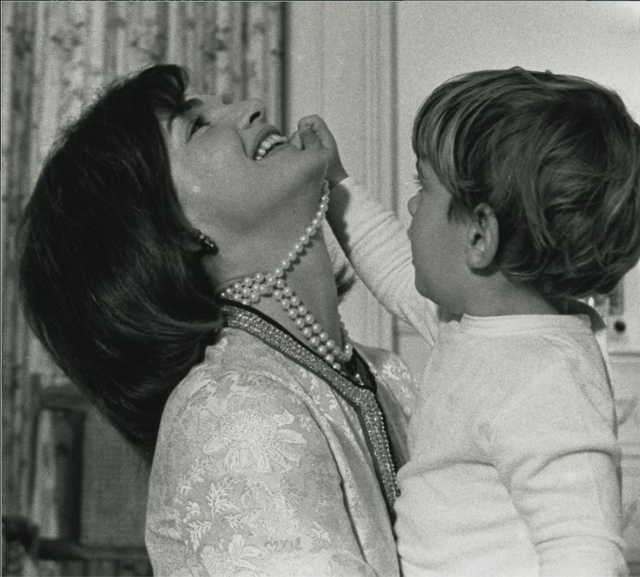 John, Jr., playfully tugs at one of the three strands of Jackie’s famous simulated pearl necklace, which was also auctioned off by Sotheby’s. Photo courtesy the JFK Library. Her children, Caroline and John, Jr., wrote, “In deciding what to do with our mother’s possessions, we were guided first and foremost by her deep knowledge of and love of history.” Another symbol of Jackie’s fascination with the past was a design book she edited titled In the Russian Style. It is a look back at the great rulers of Russia through the monarch’s fashions, the things they treasured, and their design legacies. The Metropolitan Museum of Art collaborated on the coffee table book that includes pageantry ensembles, interiors of cloyingly ornate royal palaces and art owned by the kings and queens spanning from Peter I to Alexander III. 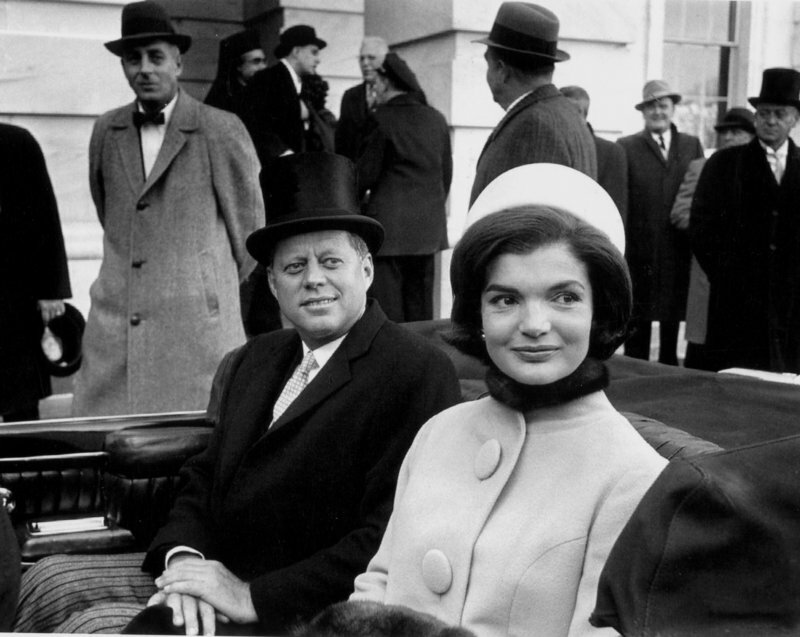 Jackie O’s Inaugural Day oversized pillbox hat set the tone for her fashion legacy. Thinking back to her entrée onto the scene, it was, of course, Jackie’s wardrobe that gave us the first indication she would be classicism’s tour-de-force—her ensembles for the inaugural festivities setting the tone for the three years she would be First Lady (who can forget that oversized pillbox hat?). But her devotion to timeless interior elements would be her most enduring legacy, showing itself early in her restoration of portions of the White House. She proudly debuted the effort during her renowned televised tour, which aired on CBS in the spring of 1962 (above). Over 46-million viewers watched as she spoke demurely about what had been achieved and her desire to make each space special. The Red Room of the White House, one of the spaces to feel the sensitive restoration carried out by Jackie and her committee of experts. 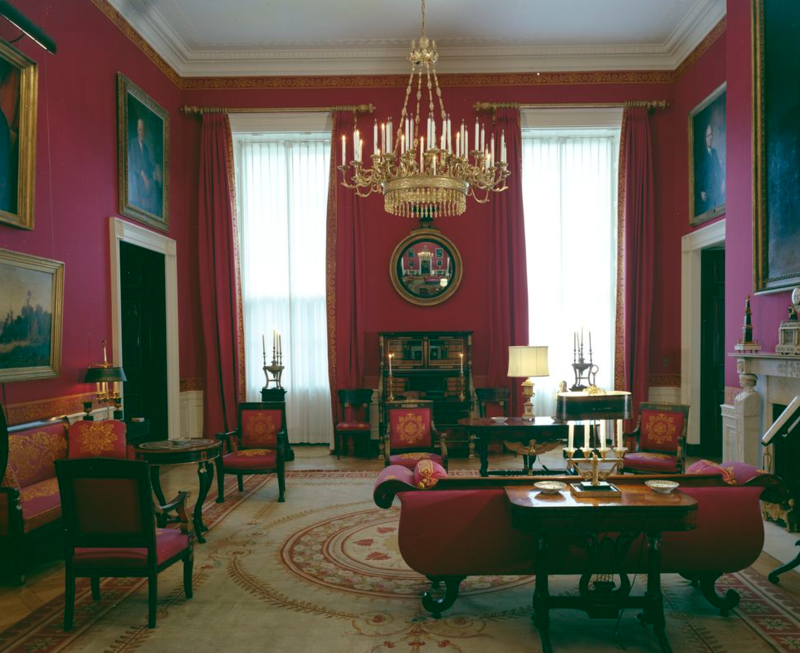 The Red Room and State Dining Room (above and below) are examples of the excellence she orchestrated with the help of a handful of talented advisors she had gathered around her, including Winterthur’s Henry Francis du Pont, whose influence considers significantly in many of Currey & Company’s products. 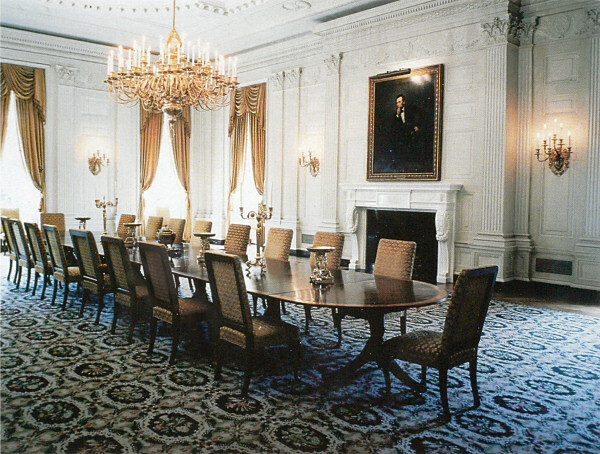 The State Dining Room is another restored room thanks to Jacqueline Kennedy. Later in life, it would be her advocacy in saving Grand Central Terminal (GCT) that added a gem to her preservationist legacy. Both efforts show her regard for historic design and her passion for our country’s architectural treasures, a drive that we believe earns her a debt of gratitude from those of us who leave, breathe, eat and sleep design. The Jackie Kennedy Onassis Foyer at Grand Central Terminal, a tribute to her willingness to speak out for the restoration of the architectural gem. Photo © Saxon Henry. 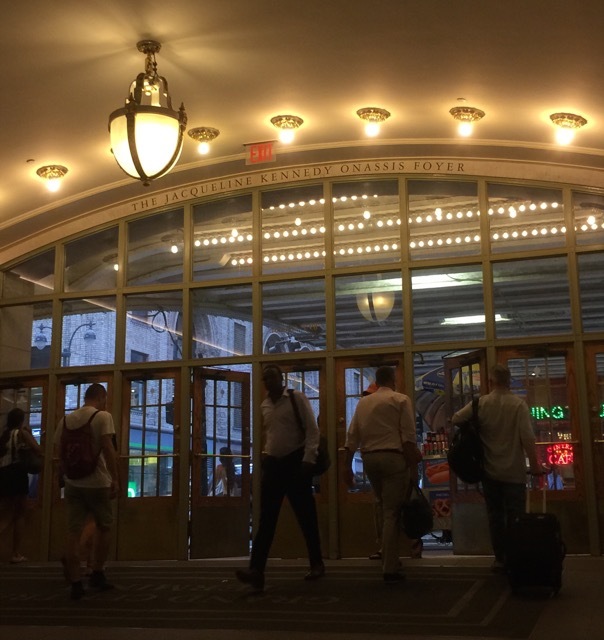 The main entrance to GCT was dedicated as the “Jacqueline Kennedy Onassis Foyer” last year, honoring her work in helping the New York City Landmarks Preservation Commission save and restore the station. I took the time to stand in the graceful entryway recently and it is such a fitting a tribute to her, down to the video looping continuously on the west wall with snapshots of her life and her efforts. 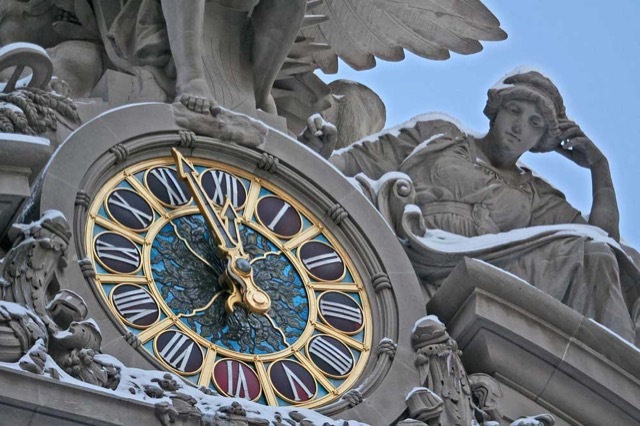 The beautiful clock, the largest Tiffany glass clock in the world at 13 feet in diameter, is a centerpiece in the sculptural detailing above the main entrance to Grand Central Terminal featuring Minerva, Hercules and Mercury. As the Sotheby’s catalog illustrates, her attraction to tradition was not simply a public persona—she lived surrounded by special pieces in the classic style. Flipping through the book felt like being granted entrée to the life of a well-traveled sophisticate, elegant furnishings I describe in more detail on my blog post pairing Jackie O’s taste with Currey & Company’s furnishings. I eagerly combed the catalog to see what serious literature she had on her bookshelves, finding poetry by Edith Sitwell and Robert Lowell, an autographed copy of Truman Capote’s selected writings, a copy of Courtiers of Henry VIII signed by the author David Matthew, and three volumes of Memoirs of Napoleon Bonaparte by Richard Bentley. An avid interest in historic design and garden literature was also evident, perhaps a result of her involvement in restoring the White House. 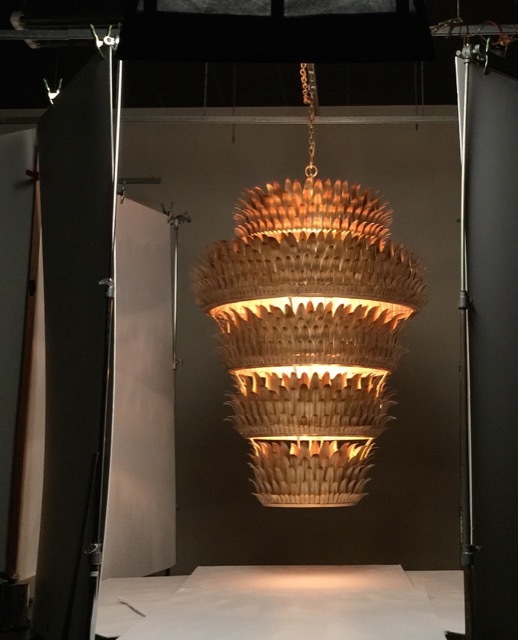 The Havana Grande chandelier was being photographed during my visit to Currey & Company. 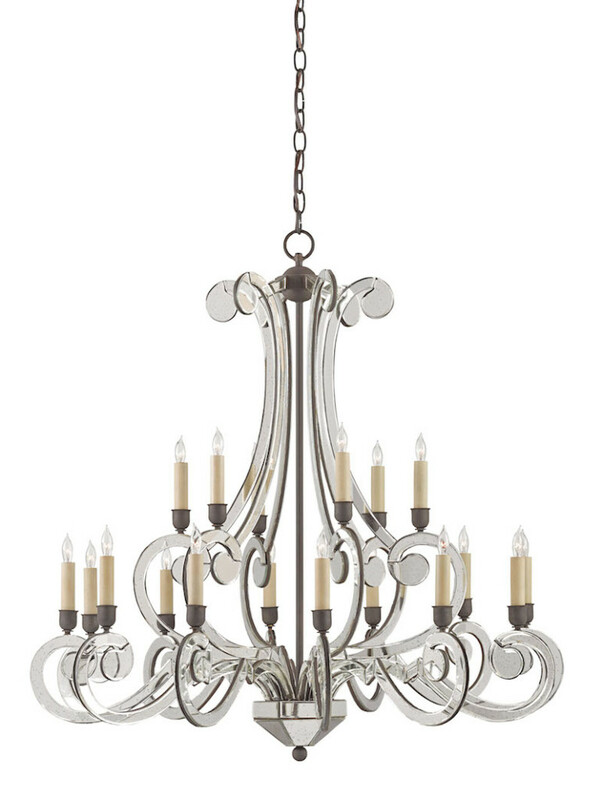 The wrought iron stunner, finished in contemporary gold leaf, pays homage to the plant world and old Havana. To give you a hint of why Currey & Company’s new releases brought the former First Lady to mind, we’re sharing a few of our favorite pieces that we feel would resonate with a polished person on par with Jackie O furnishing a Fifth Avenue apartment today. 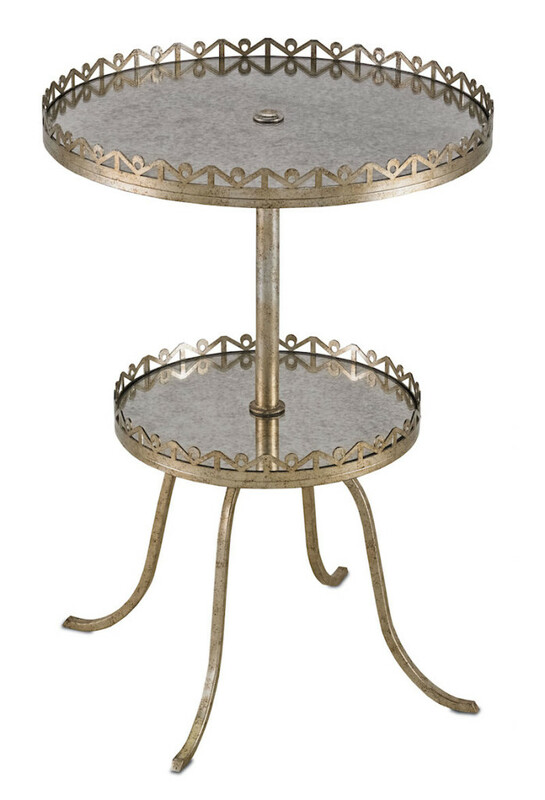 The Bellevue accent table is made of metal and mirror, the finish silver leaf and the mirror antiqued. To accompany these beautiful products, I thought it would be fun to give you a peek behind the scenes so I asked Brownlee Currey, the company’s President; and Bob Ulrich, Vice President of Sales and Marketing, to share their thoughts about the creative vibrancy for which this company is known. 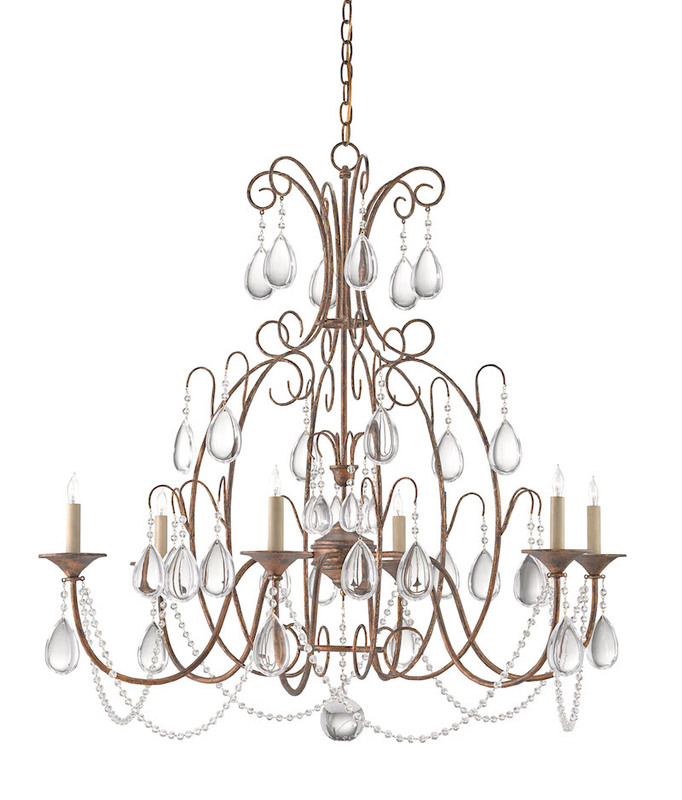 The Cinderella chandelier, as dreamy as the fairy tale princess in her ball gown, is made of wrought iron and crystal, the finish Nero Oro Antico. I asked Brownlee to address the historical aspects of their point of view, and he told me, “The company is deeply rooted in historical furnishings. 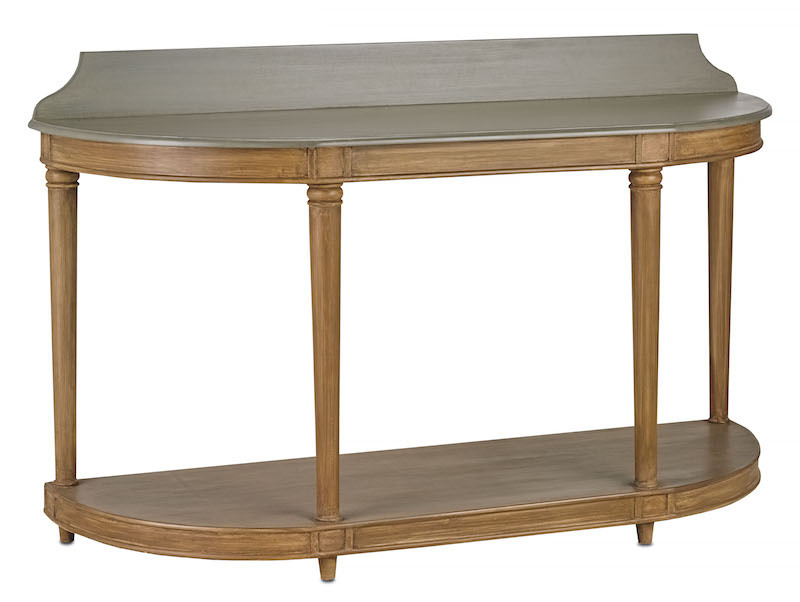 In fact, our very first products were accurate reproductions of classic garden benches from the Winterthur estate. One might say that our very origins were looking at older things. 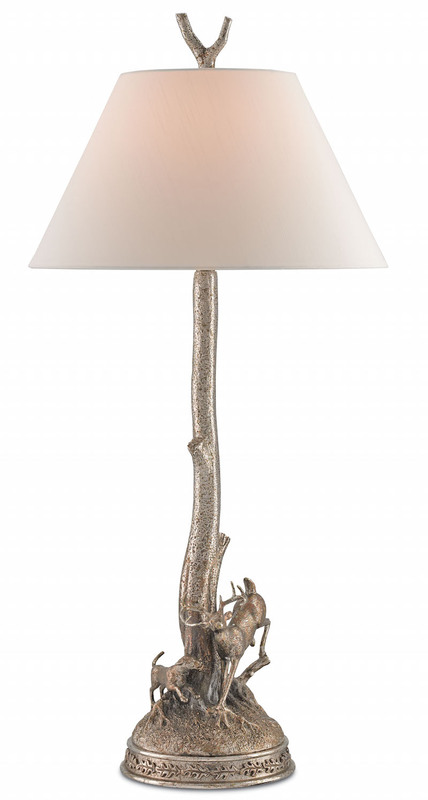 The Stag table lamp is made of brass and given a tarnished silver finish, shown here with an off white shantung shade. “My father [Robert Currey] is prone to say, ‘there is no new geometry,’ and while he is correct, I don’t quite think this gets the whole point across. Personally, I believe what he is saying is that form, scale and proportion never really change, though decorative styles certainly do. Therefore, history is our best guide to the future and an invaluable reference in our design work. 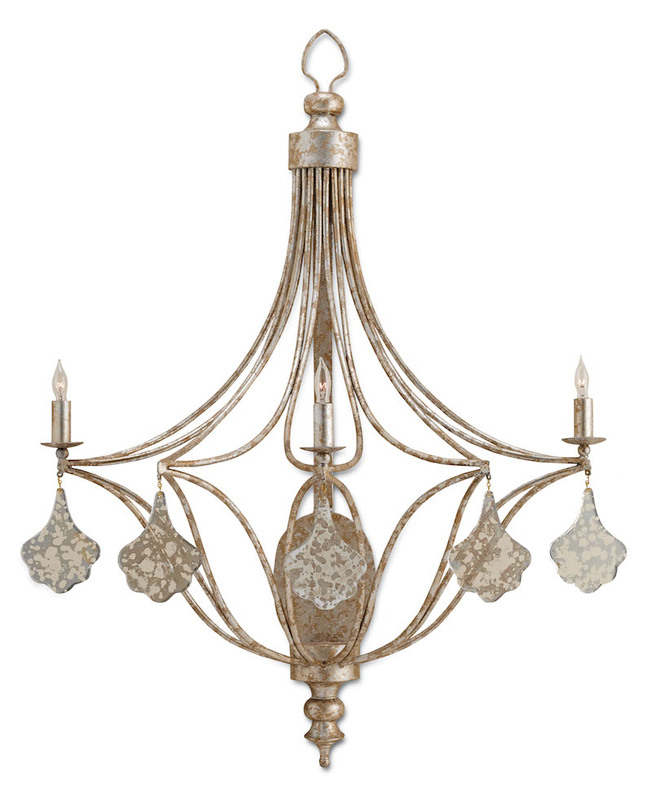 The Belgravia chandelier, with 18 lights, is wrought iron and mirror, the finish on the metal Old Iron and the mirror given a light antique finish. The Tolbert Demi Lune dumbwaiter is finished in a gray and natural whitewash for a classically sophisticated feel. Since Bob’s point of view has been honed interacting with the company’s loyal buyers, I asked him to tell me how he believes the design team is able to continue to create notable furnishings that set the bar so high. 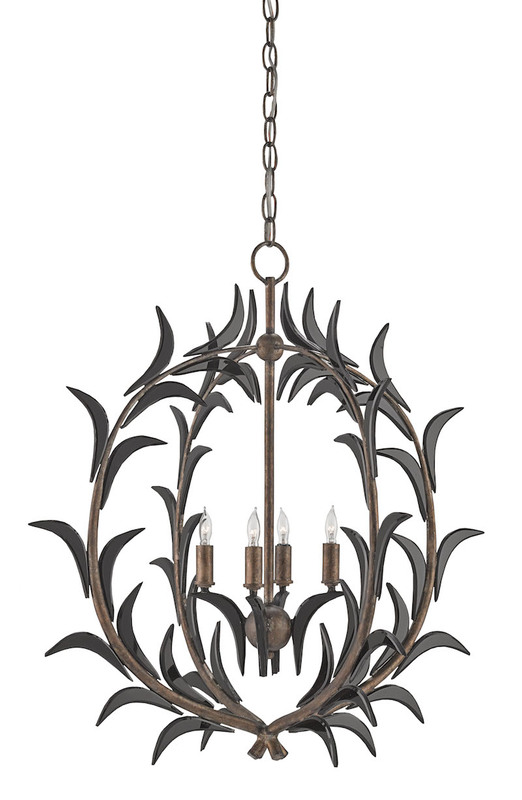 The Malverne chandelier is made of wrought iron and mirror, the metal finished in Pyrite bronze and the mirror treated to a black finish. The Lavinia wall sconce is made of wrought iron and glass, the metal finished in a Grecian silver leaf and the glass treated to an Antique Mercury finish. Distinctive is certainly a word that resonates for me when I think of both Currey & Company’s products and Jacqueline Kennedy Onassis. She knew the value of celebrating what had been, down to her declaration during an interview for Life magazine on November 29, 1963—a week after her husband had been assassinated. Using a historical reference, she told the journalist Theodore H. White that JFK’s presidency was “one brief shining moment that was known as Camelot.” It feels “one brief shining moment” is also an apt description of her graceful life, don’t you think? 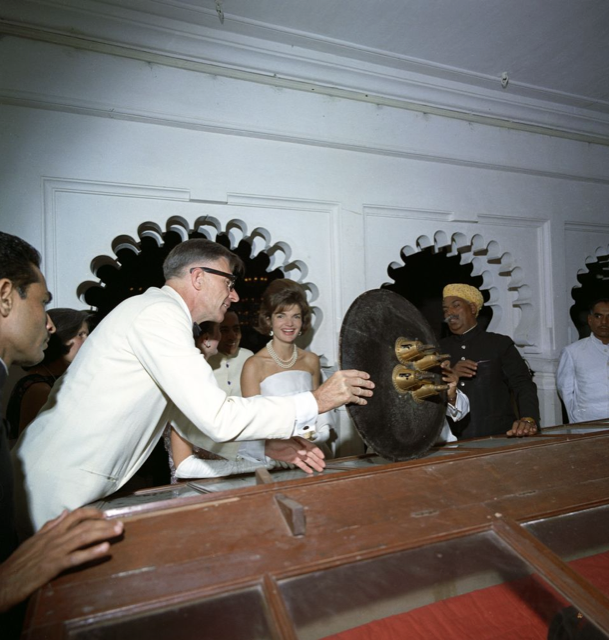 A vibrant Jackie Kennedy is photographed at Fateh Prakash Palace in India during her visit to the country as First Lady. Photograph courtesy the JFK Library. We hope you enjoyed this look at one of history’s greatest design influencers who took the meaning of special to an entirely new level. This entry was posted in Currey & Company, Entertaining, Products and tagged Chandeliers, console tables, design influencers, Gold, occasional tables, Silver, Table Lamp, tabletop, Wall Sconce, White, Wood on September 16, 2015 by Currey & Company.